Until relatively recently, the work of the Portuguese poet Fernando Pessoa was little known, but in the last few years he's been rediscovered by several critics, mostly on the strength of various translations of his Livro do Desassossego or Book of Disquiet, a collection of unfinished angst-ridden texts found in a trunk after Pessoa's death. The fragmentary nature of these writings - jotted on scraps of paper, the backs of envelopes, the reverse side of other manuscripts and other odd places - makes Pessoa a prime postmodern figure, and the trunk, whose contents are still being catalogued (it contained some 25,000 items) has taken on the same mythical character as the valise Walter Benjamin carried on his fateful escape from Vichy France. Pessoa's posthumous celebrity, like Benjamin's, is founded in many ways as much upon his life as upon his work. In Benjamin's case, his life embodies the myth of the Jewish intellectual on the run from the Nazis. In Pessoa's the story is less political; he embodies the disjointed, fractured postmodern ethos not only in his work, but in his very psyche. 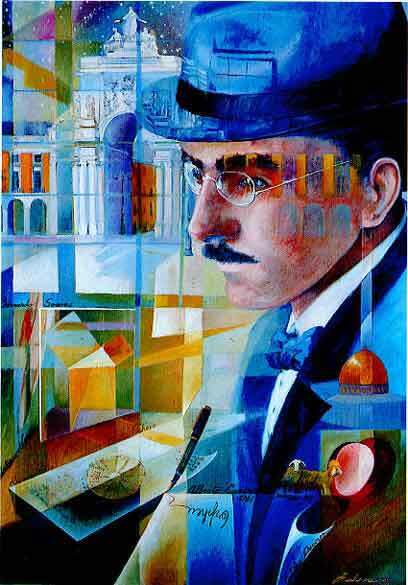 Fernando Pessoa was born in Lisbon in 1888 and aside from his childhood and adolescence spent in Durban, South Africa, upon his return to Lisbon in 1905, he never left the city again. After his father died from tuberculosis when Fernando was five his mother soon remarried, and her husband received a post at Durban as the Portuguese consul. Educated at an English high school, Pessoa proved a precocious child and brilliant student, and his early schooling instilled a lifelong love for England and English literature. In later years he took to behaving and dressing with "British restraint", and The Pickwick Papers was, he said, his constant companion. His command of English (also French) was impeccable, if eccentric, and his first published books were collections of his English poems. As his translator John Griffin remarks, these are of little interest poetically and they received courteous but unenthusiastic reviews from The Times and Glasgow Herald. Although he published articles and poems in several literary magazines, aside from his English efforts, the only other book of Pessoa's to be published in his lifetime would appear in 1934, the year before he died. Mensagem (Message) is an extended esoteric poem arguing for the return of Dom Sebastião, Portugal's King Arthur, and for Portugal's pre-eminence in a coming Fifth Empire of the spirit. Espousing Pessoa's peculiarly mystical patriotism, the book received a consolation prize in a national competition. This was a late and slightly backhanded recognition of Pessoa's genius, something that, as often happens, would only become common knowledge after the poet's death. Supporting himself as a freelance translator of English and French correspondence for several commercial firms, after a lonely, solitary life, spent in relatives' houses or in rented rooms, Pessoa, who more than likely remained a virgin, died in 1935 from acute hepatitis brought on by heavy drinking. Pessoa's poetry is aptly described as the central work of Portuguese modernism, and for this alone he deserves his belated recognition. But Pessoa wrote more than poems. His legendary trunk contained a wealth of miscellaneous writings on philosophy, sociology, history, literary criticism, as well as short stories, plays, treatises on astrology and a variety of autobiographical reflections. But in addition to the usual material produced by a writer, Pessoa is unique in that he also wrote other writers and poets. These he called heteronyms, coining the term to distinguish it from the common pseudonym. Pessoa was not simply writing poems and prose under a different name: the various heteronyms he created were individuals with their own history, biography, personal characteristics and unmistakable literary style. For a solitary individual, living alone in small rooms, to occasionally talk to himself seems not unusual. In Pessoa's case, what began as a childhood game of having conversations with imaginary characters  - "nonexistent acquaintances," he called them - became in later years an obsession with depersonalization and the fracturing of the self. Indeed, Pessoa's grip on his own self was so tenuous that at one point he took to writing to his old teachers and schoolmates in Durban, posing as the psychiatrist Faustino Antunes, asking for their opinion on the mental state of his patient, Fernando Pessoa who, depending on the letter, had either committed suicide or was under restraint at an asylum. Having no idea who he was, Pessoa hoped to gain some insight from those who knew him. Other heteronyms and poems followed soon after: the aforementioned Ricardo Reis; the futurist Álvaro de Campos (both, like Pessoa himself, disciples of Caeiro); Alexander Search, Thomas Crosse and Charles Robert Anon, all Englishmen; Jean Seul, a Frenchman; the astrologer Rapahael Baldaya; the Baron of Teive (like Pessoa, unable to finish anything, except his own life when he committed suicide); the pagan António Mora; Bernardo Soares, ostensible author of the interminable Book of Disquiet, and many more. Although new heteronyms continue to emerge, the central cast is made up of Caeiro, Reis, de Campos and Soares, with occasional appearances by Pessoa himself. Caeiro, who as a bucolic poet of sheer immediacy was the polar opposite of Pessoa, espoused a philosophy of complete unreflectiveness, a Portuguese variant of Zen satori. "My mysticism is not to try to know/It is to live and not think about it" Pessoa's master wrote, something Pessoa himself found impossible to do. This Zen quality led the Catholic monk Thomas Merton to translate some of Caeiro/Pessoa's verse and show them to the Buddhist scholar DT Suzuki. Even without Pessoa's occult interests, which we will examine shortly, his account of the appearance of Alberto Caeiro is enough to suggest something paranormal. 'Ecstasy', 'apparition', 'master': all three suggest something along the lines of possession, mediumship and Madame Blavatsky's spiritual guides, although Pessoa himself was critical of theosophy and was even advised during a session of automatic writing to "Read no more theosophical books." (His heteronym Raphael Baldaya attacked Blavatsky savagely in a predictably unfinished essay.) Although in the next decade surrealists like André Breton, Philippe Soupault, and Robert Desnos all practised automatic writing - and Breton himself was a reader of Eliphas Levi and other occult writers - their interest in it was in a sense more political than occult, or even poetic, seeking, as it were, an open avenue to the 'repressed' unconscious. Pessoa, however, for a time at least took the practice seriously, influenced in this by his Aunt Anica, a devoted student of the occult, with whom he lived between 1912 and 1914. Between 1916 and 1917, Pessoa engaged in a series of automatic writing sessions, making contact with several intelligences: Henry More, the Cambridge Platonist, a character named Wardour and a dark figure called the Voodooist. While interesting biographically, Pessoa's automatic writings - accomplished sometimes with a planchette - lack the inspiration of his heteronymic efforts; most of them are encouragements to lose his virginity (sadly ineffective) and admonitions about his habit of masturbation. "Very soon you will know what you have courage for - namely, for mating with a girl," Henry More informed him. "You masturbator! You masochist! You man without manhood!... You man without a man's prick!" another astral interlocutor opined. On other occasions these sessions produced a variety of occult signs and symbols, Masonic and kabbalistic insignia whose meaning troubled Pessoa. Although there is no traceable connection between the Gnostics and the Rosicrucians - several centuries separate them in time - Pessoa associated the Gnostic idea of the fallen world and the demi-urge responsible for it, with the 17th century followers of Christian Rosencreuz. Although Pessoa did know a few people who shared his occult interests, most of his contact with other occultists was via correspondence. Of these, the most celebrated was Aleister Crowley. In recent times, the extent to which Pessoa read Crowley and actually modelled his own ideas about secret societies on accounts of Crowley's own groups, has become the subject of historical research. Pessoa first made contact with Crowley when he wrote to the Great Beast, pointing out an error in the natal horoscope published in Crowley's notorious Confessions (Pessoa was a keen astrologer and at one point considered pursuing the craft professionally). Crowley replied and the two poets exchanged letters and writings; Pessoa even translated Crowley's "Hymn to Pan" into Portuguese. In September 1930, Crowley arrived in Lisbon, with his current Scarlet Woman. The couple quarrelled and Crowley's girlfriend left the country, leaving a deflated Great Beast behind. Crowley then enlisted Pessoa's aid in faking a suicide. Leaving a forlorn lover's note at the Boca do Inferno (Mouth of Hell) - a treacherous rock formation on the coast west of Lisbon - Crowley implied that he had taken his own life by leaping into the sea. Pessoa explained to the Lisbon papers the meaning of the various magical signs and symbols that adorned Crowley's suicide note, and added the fact that he had actually seen Crowley's ghost the following day. Crowley had in fact left Portugal via Spain, and enjoyed the reports of his death in the newspapers; he finally appeared weeks later at an exhibition of his paintings in Berlin. Given Pessoa's frail ego, it was more than likely a blessing that his association with the Beast was brief. Pessoa and Benjamin have much in common. Besides their mutual penchant for the fragment - Benjamin's Arcades Project and Pessoa's Book of Disquiet are both works that refused completion - Pessoa and Benjamin shared an equal ineptitude with dealing with reality or the necessities of life. Both lived more in books than in the world, and both had great difficulties maintaining relationships with women. Both shared an interest in forms of occultism (Kabbalah and graphology for Benjamin) and both died at a tragically young age, Pessoa at 47, Benjamin 48. The valise Benjamin hauled across the Pyrenées in his attempt to reach Spain held the contents of his monumentally unfinished magnum opus. A very readable fictional account of this disastrous venture can be found in Jay Parini's Benjamin's Crossing (1996). Although a commonplace childhood experience, the vividness of Pessoa's invented friends bears comparison to the similar early pastime of the psychologist CG Jung. In his childhood, Jung became convinced of the reality of a separate self, whom he called Personality No 2, an old gentleman of the 18th century, who dressed in buckles and frock coat, and who was possessed of an uncommon wisdom and insight. Jung became so immersed in the world of No 2 that he came to believe he had been the gentleman in a past life. For detractors of Jung, this is early evidence of his later psychosis; for his followers, it was a manifestation of the autonomous contents of the psyche. Following his break with Freud, Jung underwent a shattering mental breakdown in which he had visions and, most important for his later ideas, held conversations with autonomous personalities resident in his own mind. Fernando Pessoa Selected Poems (London: Penguin Books, 2000) p11. Ricardo Reis is the subject of a novel by the contemporary Portuguese writer Jose Śaramago, The Year of the Death of Ricardo Reis (1991). The Selected Prose of Fernando Pessoa translated by Richard Zenith (New York: Grove Press, 2001) p256. Álvaro de Campos was another compensatory figure. A world traveller, he smoked opium, studied naval engineering at Glasgow, voyaged to the Orient, drank absinthe and wore a monocle. On occasions, de Campos would appear in Pessoa's stead at social gatherings, and in 1929 he broke off Pessoa's single romantic liason, writing to the girl and telling her to flush any idea of their union "down the toilet." Selected Prose pp103 and 110. Ibid. pp101-102. The shapes, designs and symbols Pessoa saw suggest that this was a hypnagogic experience. Selected Poems translated by John Griffin, p70. See Marco Pasi's "The Influence of Aleister Crowley on Fernando Pessoa's Esoteric Writings" in Gnostics 3: Ésotérisme, Gnoses & Imaginaire Symbolique (Leuven, Belgium: Peeters, 2001) pp693-711. Fernando Pessoa The Book of Disquiet translated by Richard Zenith (London: Penguin Books, 2001) pp217, 222-223.